Decades have passed since the first victims of the Wild Card virus appeared in public life. 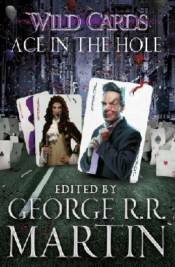 Transformed into Aces - with useful and remarkable powers - or Jokers - deformed and twisted - the virus has changed lives. But not all mutations are easily identified. As campaigners converge on Atlanta for the Democratic Party Convention, one man sets his final plan into motion. Gregg Hartmann, outwardly normal, polite and serious, is in fact secretly a sadistic murderer with terrible psychic abilities. He also has an insatiable lust for power. And what better hiding place is there than being in the race for the most protected, public and powerful role in the world? If Hartmann can secure the Democratic nomination, he may well become the President of the United States. But there are those who would stop him... Edited by George R. R. Martin with assistance from Melinda M. Snodgrass, this mosaic novel also contains work from Victor Milan, Walter Jon Williams, Walton Simons and Stephen Leigh.